Look at the ancient texts – the Old and New Testaments, the I Ching, the Vedas – they are all shot through with the idea of sacrificial ritual. Usually it is blood sacrifice: the sacrifice of an animal. Occasionally it is something more dark and sinister: a human sacrifice. But whatever the form, the basic idea is there, universally proclaimed. You sacrifice something of value to you, in order to propitiate the gods – the powers of nature – in order to influence future events. But that was in the past, wasn’t it? We’ve grown beyond all that now. We’re much too sophisticated to take any of that stuff seriously any more. And yet… and yet…. Don’t you still feel something stirring inside of you? Doesn’t something still beckon from the depths? Not the gods any more: something else, something deeply subsumed into the very flesh of your heart? A human being is a complex creature. We are made up of many parts. And while we strut about in our urban haunts thinking we have everything under control, it’s clear from the state of the world that there are unseen forces at work, and that the human race as a whole is completely out of control. In other words, there are still gods to propitiate. Not external powers, internal ones. The powers of the hidden drives and instincts, beautiful and monstrous at the same time, that are even now pushing the world to the edge of extinction. How to harness and control those forces? How to propitiate the gods of our own internal being: that is the question that lies at the crux of our time, at this decisive moment, when our very survival as a species is at stake. In fact we do still practice rites of sacrifice, it’s just that we’ve been cut off from their meaning and their origins. The Easter story is one such act, the sacrifice by a Father of his Son; and in honour of this primal sacrifice we substitute a lamb. Except we don’t do the actual sacrificing any more, we allow the butcher to do it for us. And the lamb was never ours: we picked it up, pre-packaged, from the supermarket shelf. So is there anything we can sacrifice now, something truly our own, that might satisfy these obscure urges? It is something so close to us, so close to our very being, that we’ve almost forgotten it is there. Money is, to use the jargon, “a general equivalent value form”. In other words, money can be anything you want it to be. It can be new shoes, new clothes, a new car. It can be a holiday in the sun, a meal with the family, an evening with friends. It can be a conspicuous display of generosity, the hidden hand of kindness, or a secret urge to hoard. It can be anything or everything, depending on your imagination. There is nothing in our current world-system that money doesn’t touch. The copy of Kindred Spirit you are holding in your hands right now will have cost you money. No matter how spiritual you are, money will still insert its presence into your life through the mechanism of exchange. Money pervades our lives at every level. It structures the way we think. The way we deal with each other as human beings is on the basis of value and exchange. If we perform a good deed, even in secret, we still feel the world owes us for it. Hidden away in the personal account book of your life, let me assure you – unless you are a very exceptional person – you have a secret list of debts going back to your childhood, that you still feel the world owes to you. Jonathan Harris, “the Money Burning Guy”, describes money as “an aspect of being”; which is why, he says, it makes the perfect sacrifice. I undertook my own ritual sacrifice on the 23rd October 2016, at the Cockpit Theatre in London, where I set light to a £20 note. It was the first money I had ever burned. I did it in the company of Jon Harris and two other people, around a small table in the centre of the theatre, watched over by an audience of perhaps 50-70. I can’t say that anything particularly profound happened to me that night, but in the days following something did, indeed, begin to take shape in my mind. I began to feel that the mysterious something-or-other that lies behind money – call it “value” – is eternal. It was a feeling that crept up upon me in various small but surprising ways. I sensed that the burning of my £20 note didn’t remove the value that lay entangled in the note, it released it; that the value remained, even though the note was gone. I could still feel it in my presence somewhere, like a dream that lingered into the day. I felt that the specific quantity of monetary value that the note represented linked in some indefinable way to a more general quality of value that lay out there, somewhere in the vast and unknowable universe. It was like a little chink opening up in my brain, allowing me to look through to the meaning of money. What is value? How do we create it? What makes us value one thing over another? It comes from inside of us, not from the piece of paper. It is us, our imagination, that gives value to money. Afterwards, if people accused me of wasting the money, I could tell them, quite confidently, that I hadn’t wasted it at all: that the value was still there. It had merely changed its form. Jon Harris has always been interested in money, he tells me. As a child he had a coin collection. He’d spent many a happy hour with a favourite coin clenched in his hands, imagining where it had been. Later, as an adult, he’d expended much energy in the pursuit of money. He’d been an entrepreneur, made a lot of dosh, then lost it again. He’d been a market trader, at the raw front line of cash exchange. He’d studied the history of money at the London School of Economics. And then, in 2005, an idea came to him. He was feeling frustrated with his life, and, brought to a sudden halt at the junction of two roads, at the confluence of two rivers, he thought, if you really want to understand the reality of money, then you should burn it. In this he was influenced by the KLF*, the pop band of the early nineties, who had burned a million pounds. He thought you could define your freedom by your ability to burn money. It took two more years before he got round to actually doing the deed. That took place on the 23rd October 2007. It was a much more modest amount than the KLF had ventured, only £10, but considering he was flat broke at the time, it might as well have been a million. Properly speaking it wasn’t even his money. He was bankrupt, so the note was owed to his creditors. The way he got round this was to carry it around with him for a month beforehand, till it really felt like it was his own. He refused to spend it, would take it out every so often and ponder it, imagining where it had been, just as he had with his coin collection as a child. After that it became an annual event. On the 23rd of October every year, all by himself, he would burn money: £20 usually. It takes a marked level of inner focus to do that. Burning money is one thing: burning it year in, year out, without any recognition or result, knowing that other people would consider him crazy, that was something else. Something must have been driving him on. He says he was aware from the first it was sacrificial ritual he was engaged in, but that over the years his understanding of what that means has deepened. Sacrificial ritual is sovereign, he says. It is the first thing. It is what defines us as human beings. Before there was anything else, there was sacrificial ritual. This is what gives money burning its potency. It involves sacrificing something very dear to you, the hidden element of desire that the money represents. It is a sacrifice without a victim. The victim is yourself. You are both priest and offering, sacrificer and sacrificed, giving and taking at the same time. So that’s new, isn’t it? New and yet incredibly ancient. Sacrificial ritual, the oldest religion on the planet, with a brand new sacrifice to offer. It is a ritual of pure forgiveness, he says. That is what lies at the very heart of the money burning ritual. 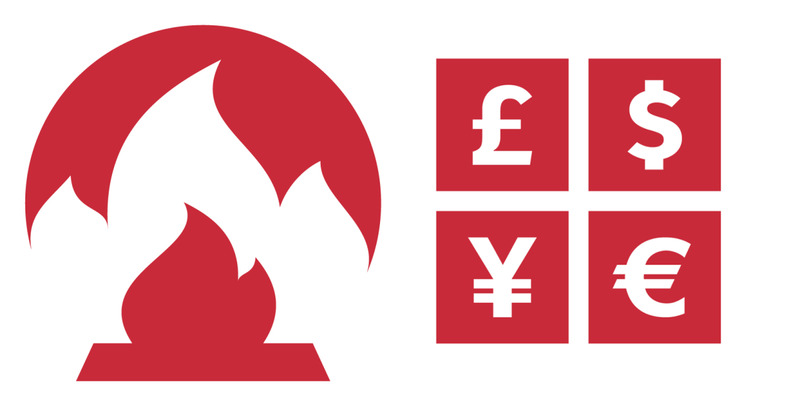 The burning of money turns something that once existed into something that no longer exists. What was once a store of value is now a heap of ashes. The earthly note, with its earthly promise, becomes transformed – transmuted, transmogrified, transubstantiated – into something else, something that can no longer be quantified. Pure value, without ownership. This is why you have to burn it, why you can’t just give it to charity. If you give it away the money still exists, the debt is still there, and the sacred act of forgiveness hasn’t taken place. Jon continued his personal sacrifice every year on the 23rd October for a number of years, without any fanfare or interference from the outside world, until the 23rd October 2015, when, for the first time, he shared the experience with someone else. It was after this that money burning as a concept reached out into the world. From a secret indulgence, something practised on his own, in private, it became, firstly, a public performance, and then, a shared ritual: one in which the whole world could partake. He met John Higgs, the author of the book* on the KLF, and through him a number of people crazy enough to think that he wasn’t crazy. He wrote his Money Burner’s Manual, a sometimes dense, occasionally incomprehensible, convoluted but compelling exploration of the meaning of money. He produced a magazine for the money burning community, called the Burning Issue, even though no such community existed at the time, and by that process, created the very community it was meant to serve. He does not encourage people to burn their money. Indeed, he says explicitly “never ask or tell anyone to burn money”. The Burning Issue opens with a warning not to read the magazine. Which is what we have to tell you here dear reader: burning money is a profound and magical act and you should only undertake if you understand its implications. The first thing you have to do is to pick the amount. Not too much, but not too little either. It’s a contradiction to want a cut-price money-burning experience. It has to be the right amount so it will hurt a little: enough so you will feel its loss. Jon recommends £20, as the figure you would spend on an impulse buy, but how you determine it is up to you. Next, pick a date. Any date will do, as long as it is significant to you. Good Friday or Christmas Day. Summer or Winter Solstice. Your birthday. Your Mum’s birthday. The Full Moon or the New Moon. Any day you choose. Pick a note. Separate it from the other notes in your possession. Take note of its serial number. Make sure it is your own money and not somebody else’s. This is really important. The pain has to be entirely your own. Get to know the note personally. Carry it around with you. Get it out and ponder it occasionally. Where has it been? Whose hands has it passed through? What has it bought? What might you have bought with it? Be clean and spruced up on the day, in your best clothes. It is the Being of Money you will be encountering here, so put as much effort into it as you would into meeting a friend or a lover. Light a candle, and have a bowl in front of you to receive the ashes. Then, when you are ready, fully focussed and in the moment, put the note to the flame. Try to be totally present as you do this. Totally aware. Totally you. Watch as the flame consumes the note. Hold it for as long as possible, at the right angle. It will burn more slowly at certain angles than others and you will want to make the most of it. After all, it is your money you are burning. Finally, when the flame gets too close to your fingers, drop it into the bowl and watch as the embers eat away the last remnants of the paper. Say some words if you like, or stay silent. It is up to you. Remember, it is a ritual of pure forgiveness. Your purpose is to forgive the debts you feel are still owed to you. Don’t expect too much from it, and don’t do it too often. Don’t turn it into a routine. It is something rare and sacred, and its value will come to you in its own time. Go back to your ordinary life afterwards, and spend your ordinary money however you see fit. Dispose of the ashes in your garden or in a plant pot. Your ordinary life still awaits you, but with a new value attached. * The KLF were a hugely successful band from the early 90s. They had a string of hits, including: “What Time Is Love?”, “3am Eternal”, “Last Train to Trancentral” and “Justified and Ancient”, featuring country music legend Tammy Wynette. What makes the KLF peculiar, and John Higgs’ biography* of them so compulsive, is something they did after their pop career was finished. They burned a million pounds. In “the wee small hours” of the 23rd August 1994 the two members of the band, Jimmy Cauty and Bill Drummond, went to an abandoned boathouse on the remote Scottish island of Jura and there, witnessed by their tour manager and a journalist friend, they systematically burned a million pounds in crisp, clean, brand-new, government-issued £50 notes. And as if this wasn’t strange enough, afterwards they were entirely unable to explain why it was they had done it. 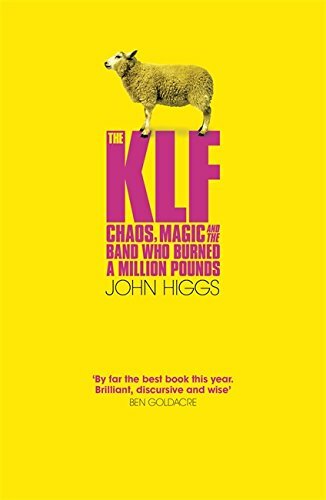 In the KLF: Chaos, Magic and the Band who Burned a Million Pounds John Higgs takes us on a hugely entertaining journey through the history of 20th century culture, in search of an explanation for this unprecedented act. For copies of the Money Burner’s Manual and for other information about Jon Harris, ‘The Money Burning Guy’. This entry was posted on 30 August, 2017 in homepage and tagged Burning money, C.J Stone. Bookmark the permalink.